Despite defending the card on those fronts, I think a bigger problem is that it just wouldn't be that interesting or fun. Players tend not to like attack cards that give no benefit (e.g. Saboteur, Sea Hag) on play. I like the VP portion (there's a similar one in one of the mini-set design contests, I think?) but the cursing just isn't exciting at all. I think there is one. Originally Hedge Maze was only counting the piles of cards costing 0$, but i felt that was awkward. On Demolition -- the double line is off-putting. I like the general idea (cheap province that junks you a lot more) but I'm not sure about the implementation. It makes trashing attacks even swingier than they normally are. Swindler hits your Estate... now your Demolitions are all worthless. I'm also not sure if it would be fun to feel constricted against trashing. Setup: Each player puts 6 VP tokens on his rental mat. Whenever he trashes a VP card during his turn, he removes one VP token from the mat. 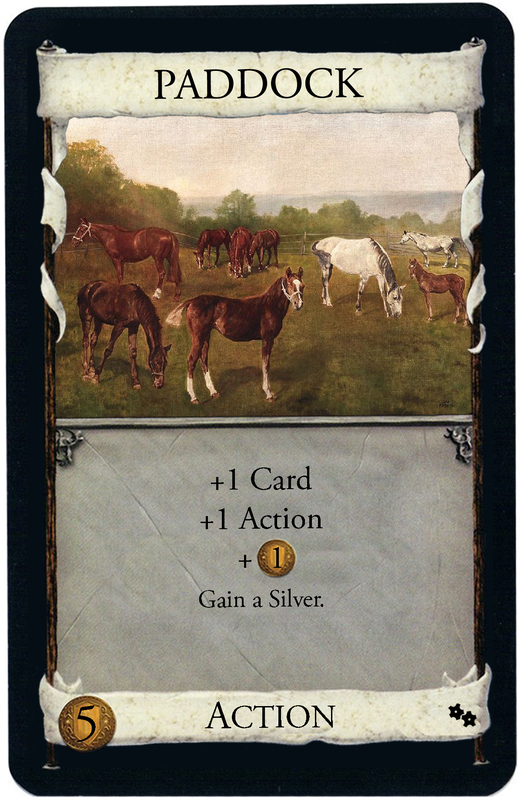 This is worth 1 VP per VP token on your Rental mat. Discard any number of cards. +1$ per card discarded. When you gain this, gain two differently named Victory cards costing less than this and trash a Province from the supply. Any thoughts? 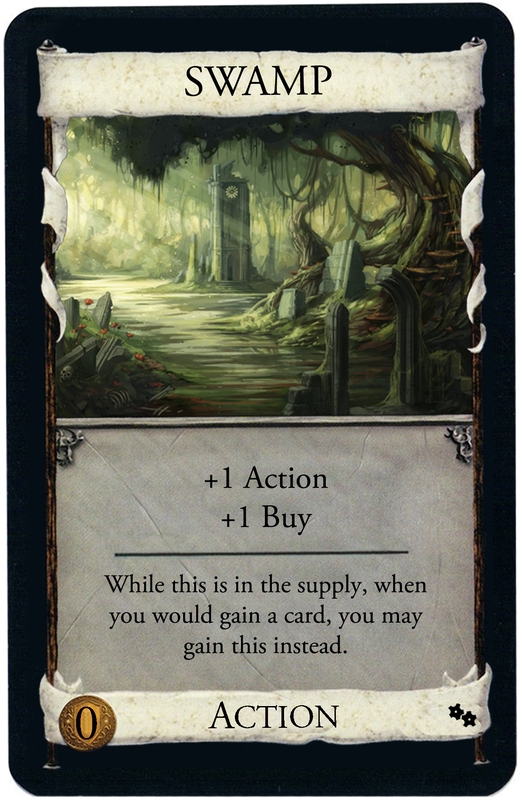 I don't want to have two cards that have so similar goals (though not same), so if i can't combine them i will dismiss one. Which one should i get rid of? I don't think the idea of rental is that good. Punishing you for not trashing is bad. and when there is no trashing it's a cheap province. Still, you could try testing it if you really like the idea. I think the idea for headquarters is better. Except It gives alot of victory points for $6 late game, especially when there is alt. victory cards. If you re-did the card, keeping the main idea though, it probably would be okay, Gimmicky, but still okay. Put a card from your hand at the bottom of your deck. At the start of your next turn, play this again; Or: Put the bottom card of your deck in your hand. 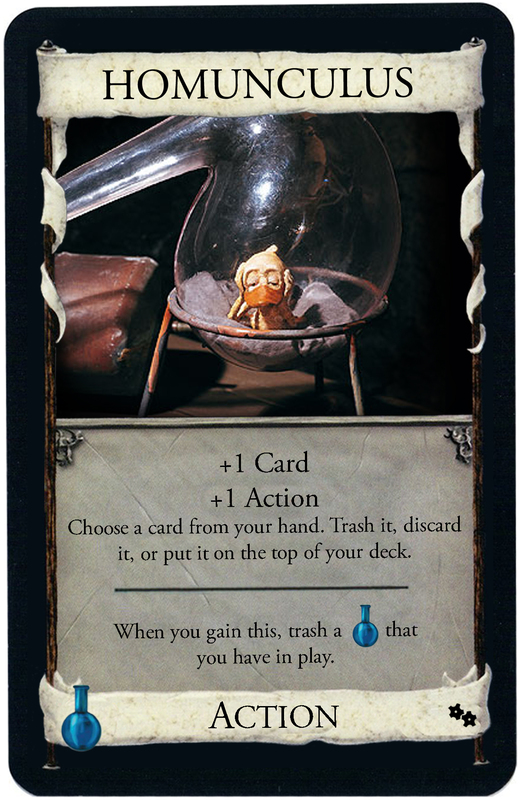 Edit: This card is basically either a cantrip that draws from the deck's bottom, or, more interestingly, a way to prepare combos by storing cards and then Villaging them. Thinking about it, the card's a bit too complex, isn't it? Ah crap, i forgot to remove the +1 card when redoing the wording. I'm not sure on the worse, but it probably really is too similar. 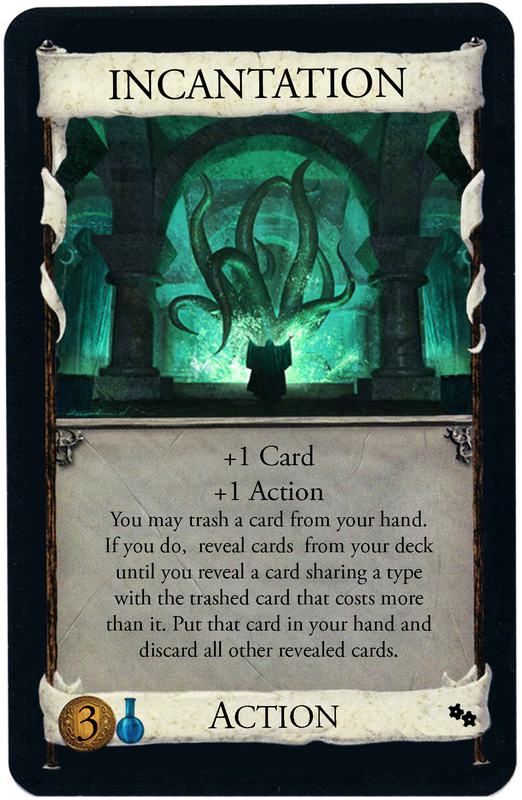 Updated the OP list of cards after some time of being rather unproductive as a fan card designer. As always, i'm grateful for opinions. Edit: If you have no opinions, i take credit cards, too. When you say "choose one" I would think that "choices must be different" is unnecessary? The choices you have for what your opponents can do will sometimes be awful for him (and I assume that you want them to be good for him). Let us say he has built up a strong deck with the use of Chapel or another trashing mechanism, you risk that he has only strong cards in his deck. And is putting his deck in his discard always a good thing? I think I would choose "Put his deck in his discard" most of the time. I really liked the idea of this card. 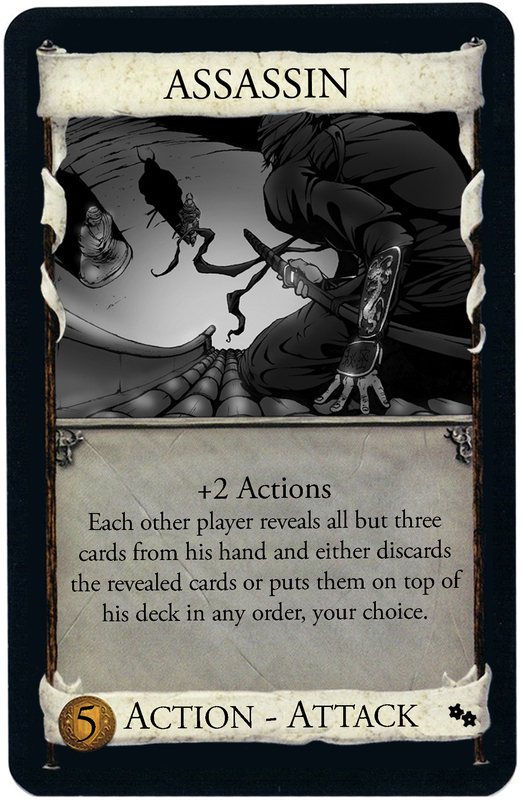 What if your opponents could choose themselves? I think that could be cool. It might set the cost down to $2? Comment one: The "choose one" is to make clear that i can't have player one do all five things so player two can't do anything. "choices must be different" makes clear i can't let player one and two do the same thing. But you are right and it can probably be shortened. "For each other player, choose another one of the following he may do". Comment two: Yes, most of the choices are not exactly great under certain situations. That's on purpose - you can for each opponent pick whatever choice you think helps him the least (well, unless another opponent allready got that benefit). Trashing is awful if all your opponent has is good stuff. Silvers can harm a trimmed engine. Drawing can trigger reshuffles (but is still pretty good). The +1VP is never a drawback, but it's also the only one that can never benefit your economy. The Chancellor effect doesn't stack. That aside, i think people generally underestimate how good it is at speeding you up. Nonetheless you are most certainly right, you don't always want it. That's why players only may do the bonus and are not forced to. Well, the point of the card is to make it deliberately political, which means that you have to be the one who chooses who gets what. There are quite some "friendly interaction" cards allready, and most of the effects on this card have been on those allready. The fact that you choose is what makes it special. 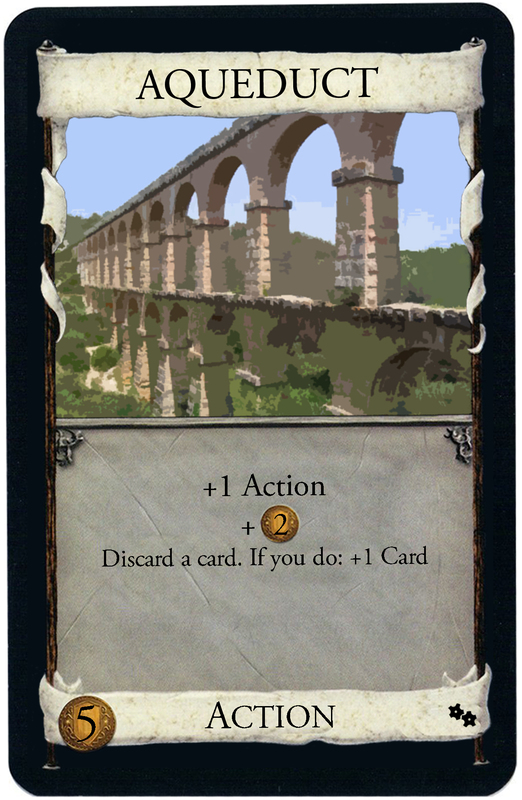 Figured i could just as well follow my own advice and add images to some of my cards. Naturally, positive feedback should now ensue. Assassin & Sultan are two new cards. Sultan is vaguely as good as Oasis (i think), being less useful when paired with Estates, Curses, Ruins and dead Actions, but better if you can meet it up with Duchies, Provinces or alt-VP, or if you have no junk in hand at all. As a gainer, it plays actually very differently. Assassin is a super-powered Militia/Ghost Ship attack. +2$ seemed a logical bonus, but i didn't want it to become a card that just goes "play one of these every turn". If you have no other actions, the bonus is useless, and if you play several, the attack doesn't stack. Tribunal is the renamed Dragon. A lot of cards don't have (good) art yet, either, so i left those out. They are in the first post, though. I like River. 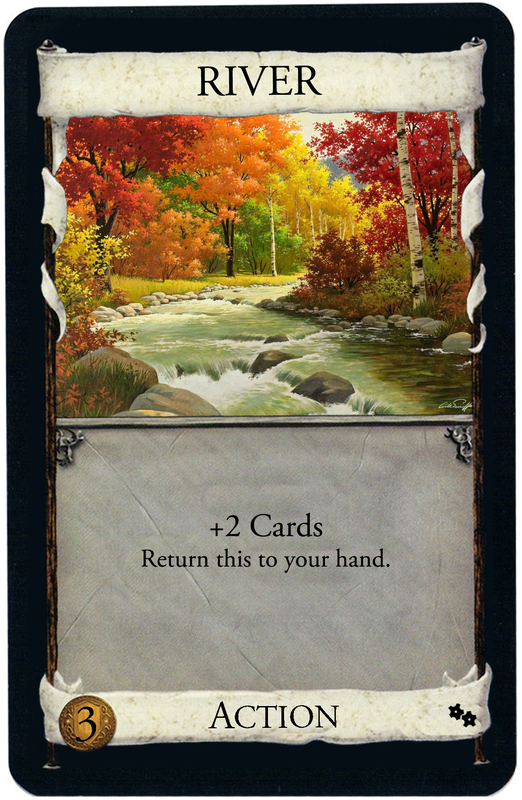 But you have to strike a balance as to how many you get - too many, and you have a bunch of Rivers in hand that you don't need. Too few, and you'll only see it once a shuffle, though the turn you get it will be awesome. When i suggested it in the "-1 action" thread, there actually was some discussion as to how strong it was. Like you, i believe that balancing how many you want is tricky (considering you may be unlucky and draw it without Villages), which is why i priced at easily available $3. I don't have people who would playtest cards with me, though, and i find solo playtests terribly unsatisfactory. So maybe i'm totally wrong here. That is a lot of +Actions. Interesting point... I guess Assassin doesn't really need to be one of those. There were some more cards that didn't have +actions, but i had no images. After some search here's part two. Should reduce the +action percentage Also has a few $4 cards. I like Assemble, but it's gonna need some clarification. Do you choose both cards before you gain either of them? Good point. I imagined that you would first gain one card costing up to $3 more and after that gain another one costing up to whatever is left, but couldn't find a nice wording for that - i guess i forgot to make it clear in either way Anyhow, i think it should only matter if Curses and Coppers both are out, but of course that can happen. Either option works for me, it's all about which wording is better. I have this: "Trash a card from your hand. Choose two card in the supply that together cost up to $3 more than the trashed card. 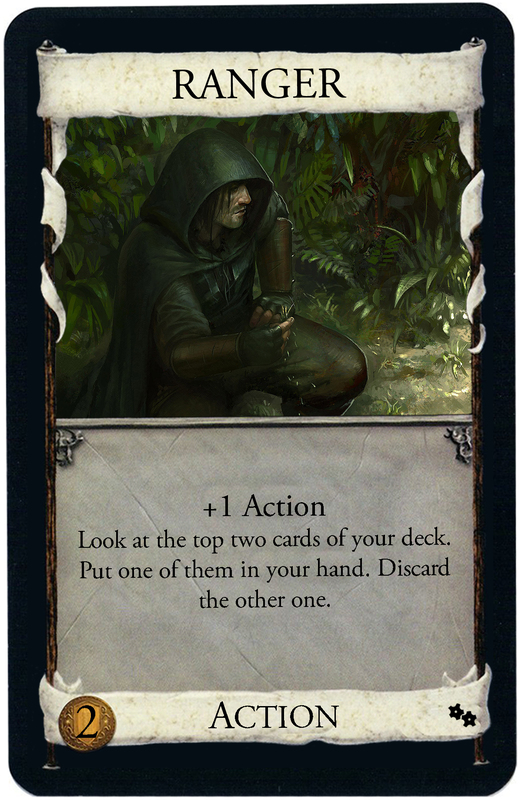 Gain them"
Edit: Changed wording It now makes clear you choose both cards, then gain them. 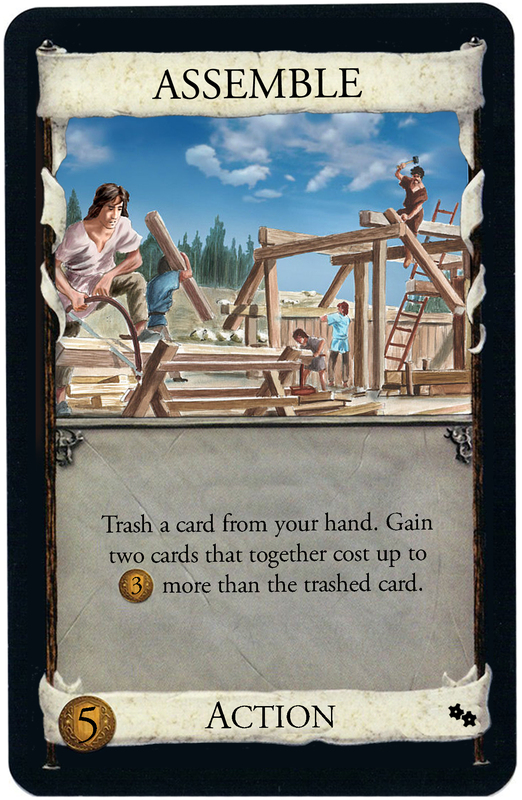 I believe with the new wording of Assemble, you cannot gain two copies of the same card, as only the top card in each pile is "in the Supply" for this kind of purpose. Same way you can't use Band of Misfits as Sir Martin if he's buried in the Knights pile. I think with the old wording, you gained a card costing up to $3 more than the card you trashed, then gain another card costing up to the remainder. 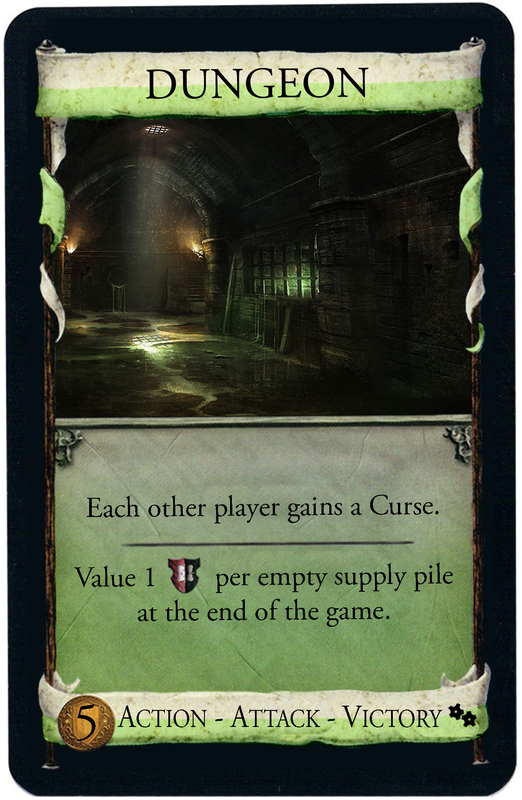 If there is no such card, you'd gain nothing, but there almost always will be either a Copper or Curse to gain. Would you recommend going back to the old wording? I'd like to give the option of gaining duplicates and wasn't aware the wording wouldn't allow it. Maybe it would be sufficient to go back and only clarify the actual order in a faq - given it will matter very rarely. I don't see where you draw that connection. On a side note, i would be glad to find a better option than the +1VP one, just so the card doesn't ask for material that's otherwise not needed. There's trashing, gaining, drawing, accelerating and i wanted one that gave no economy boost at all. 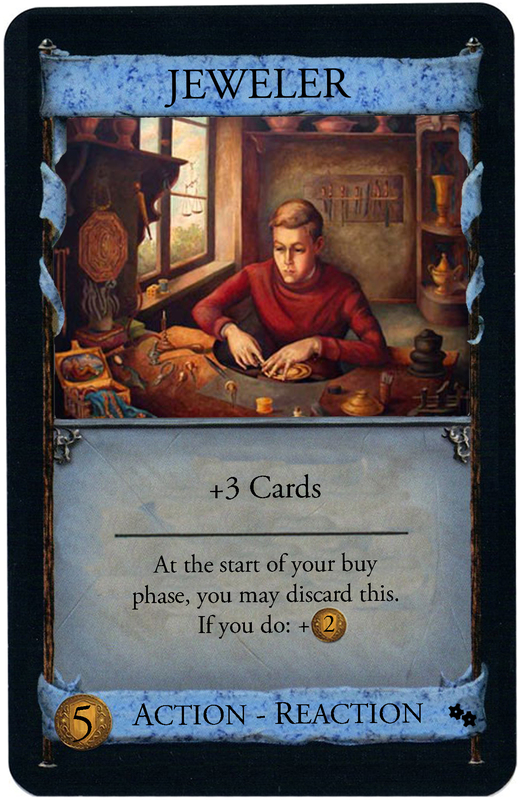 I pondered a few alternatives, including "set aside a Victory card in his hand during the end of the game", "gain a Copper in hand", "discard his hand and draw 5 new cards", but they were too redundant to the existing options.